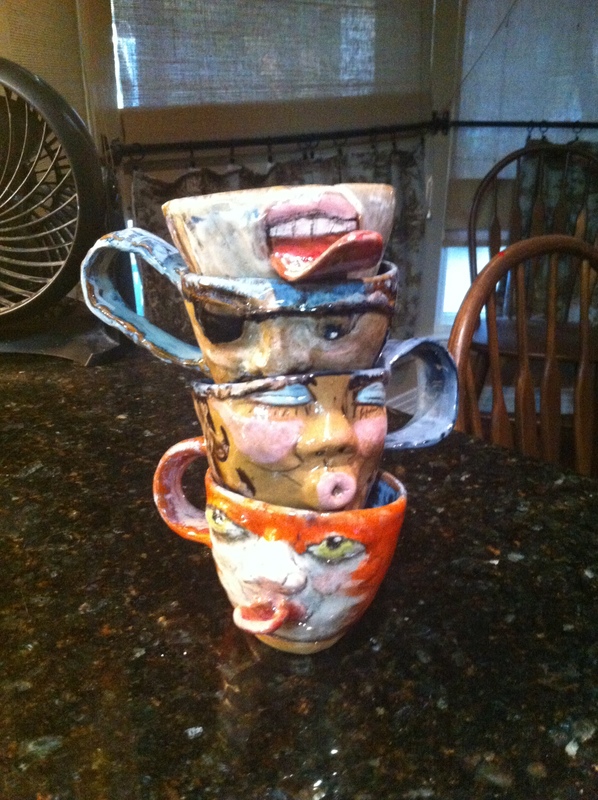 Sherry Schwartz turns coffee mugs into conversation pieces. Her handcrafted pieces feature expressive faces with exaggerated features. She’s been perfecting her style since she was in her teens, but only recently began selling her work. Alter your morning routine and pick up one of her pieces at Pop-Up Market Saturday, July 13. Read more about Sherry below. My inspiration comes from many sources. Growing up in a military family in the 1970s, we moved a lot – from Libya to Spain, to North Dakota and Texas – to name a few. And every where we went my parents “dragged” us to museums and old ruins. These experiences helped shape my appreciation for various art forms and inevitably inspired my constant need to try something new. -How long have you been creating your art? It’s tough to pin down; but probably back in high school. I fell in love with drawing and painting – doodling on everything from notebooks to envelopes. Since then, I’ve created artwork for friends, families, weddings, school and charitable auctions. Only in the last two years have I begun devoting enough time to display and sell to others. -What’s the hardest part about creating your work? Keeping a light touch. I’ve broken so many pieces by temporarily forgetting how delicate they are before being fired. Clay is a funny thing. It goes through different “states” before it is complete. 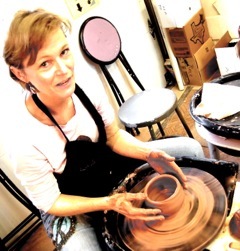 Wet clay is wonderful to hold and mold, then you have to let it rest and dry –it then becomes leather hard– which is when I do most of the “altering”. Handling it too much can weaken it –especially near appendages or handles. -What’s the best part about selling at Pop-Up Market? Meeting new people and seeing familiar faces. Last month I was thrilled to see a former art instructor of mine as well as someone I knew from my high school days! -Have you ever had any strange requests for your art? The interesting comments. I have overheard people commenting about their bosses, (while holding the tongue mug), their best friend, (the kissy face mug) or a relative while examining one of the many different face mugs I’ve created. It’s just fun. One young lady snapped a photo of a face mug to send to a friend for a good laugh; apparently it looked like her.